Our language is what we write, read, hear, see, speak, and even think. How can we immerse ourselves into another language if we are not surrounded by it? Books, signs, music and even those speaking around us are all in a different language. It can be a challenge to really understand a language when it’s not being spoken around you. So, how do you immerse yourself into another language? Remember when you were young, and how you learned your mother tongue? It seemed like you didn’t have to try very hard to learn the language. It came natural to you because the language was being spoken around you constantly since you were a baby. When you attended school, you learned how to read, write and even how to think in that language. The same is with Hebrew! In order to become fluent, you must surround yourself with the language, and in a way replace your English with Hebrew. You must be willing to become a “child” in the Hebrew language because you basically are. Because you didn’t grow up knowing the language, you have to become a child in the language in order to get those steps in becoming fluent. Children make mistakes, they sometimes mix up words, but they are constantly learning new things. Don’t try and learn Hebrew at an “adult” level or you will just become frustrated with yourself. You weren’t forced as a child to learn the language of an adult. You only learned what was useful to you and what you could understand. Then, as you grew, you learned more. Let yourself make mistakes. Laugh at yourself when you do. It’s part of learning. Language learning is enjoyable. Allow yourself to be a child! I will be using Hebrew for the language example because it’s what I’m learning and teaching. But, these tips work great for learning any language! Another thing I would like to mention is consistency is very important when learning a language. By practicing and learning every day will give you the best results when immersing yourself into another language. 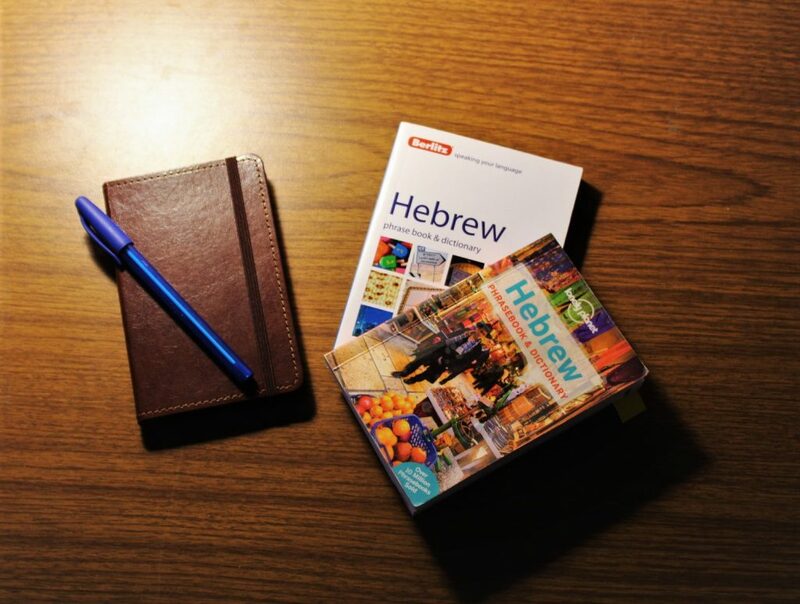 Here are my tips on how to immerse yourself into the Hebrew language. They have helped me become more fluent and just have a really good time learning the language. Listen to music in the language. Ahhhhh Music. Who doesn’t enjoy music? I have found many artists of different styles in the Hebrew language. Music in the Hebrew language is very beautiful in my opinion. But, how does this help with immersion? How often do you listen to music? I am a very musical person and I usually have music on while I am cleaning or working. Having the language playing in my ears helped me learn phrases and it has helped me personally make many connections in Hebrew. Whenever I am listening to a song and am unsure of what the artist is singing, I look up the lyrics in English. This helps me decide what kind of songs I listen to in Hebrew and it also helps me learn new words! I have also listened to many songs for kids, because the stuff they make for kids are really helpful when learning. Like I mentioned earlier, allow yourself to be child first when learning a language. Those catchy Hebrew songs for kids really do help! And they’re a lot of fun. Who doesn’t like fun? Listen to the language being spoken. I love to find videos, audios, and podcasts online of people speaking in Hebrew. Whether it’s news, weather, the Bible in Hebrew being read, fun phrase lessons on YouTube, or even just a vlogger. There are many options to choose from when listening to the language. Just listening to the language being spoken has helped me pick up phrases/words quickly. This benefits in forming phrases and conversations in the language. Carry around a phrase book/dictionary. I have two phrase books/dictionaries I purchased in Israel. These help in countless ways. They help when speaking, reading and writing in the language. Get a phrase book or two and start reading it like you’re reading a normal book in English. You will learn many new words and phrases that will improve your Modern Hebrew speaking and reading. They are great when you need to remind yourself of certain words. I use them a lot! These are really useful! Keep a vocabulary notebook. I have a mini notebook I carry around with me all the time. Whenever I learn a new word/phrase in Hebrew, I write it down with the translation next to it. Sometimes when I’m listening to a podcast, music or watching a video and I find a word that I don’t know, this notebook comes in handy. I look it up and write it down with the translation next to it. It’s where I keep all the words I am learning. (Also, a great place to put those Hebrew idioms). The notebook is helpful because I can look back on all the words I am learning and review them. It’s also really nice to look back in the notebook and see how far I’ve come. Read, Read, Read a lot. 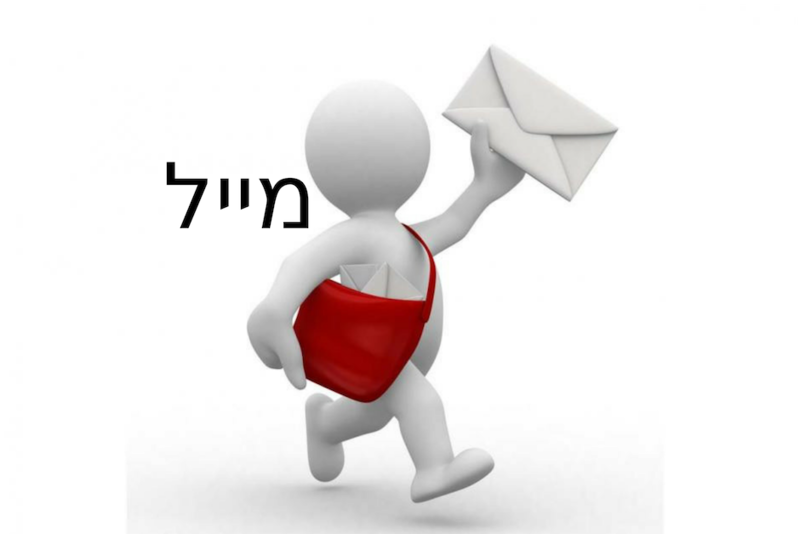 The news in Hebrew, a post on social media, an article online in Hebrew, children’s books, a verse or two in your Hebrew Bible, anything in the Hebrew language! Read something new every day. 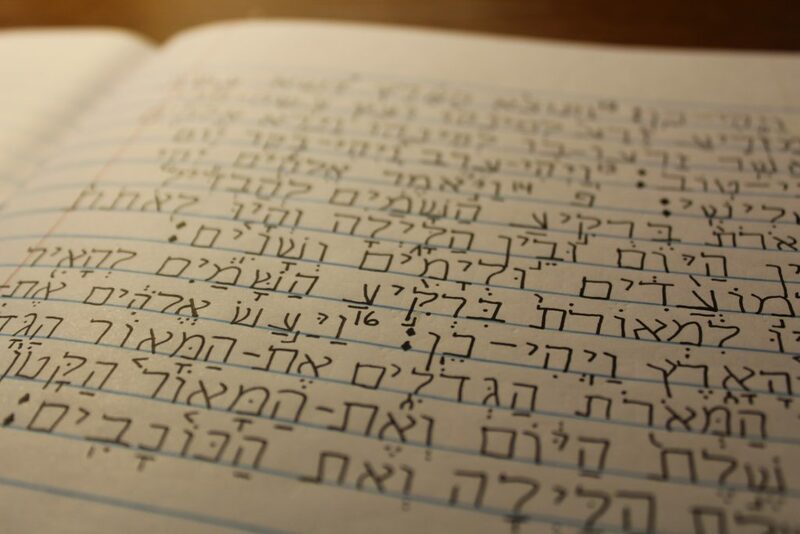 Reading Hebrew helps you become familiar with seeing and comprehending the language. I enjoy reading and studying my Hebrew Bible. Along with that, I read some form of Modern Hebrew I can find whether it’s online or in books. Talk, Talk, Talk a lot. Talk to those around you. It can be a person or even a pet of yours. Tell the person what you’re saying. Maybe even teach them to have a conversation with you! If there’s no one to practice speaking to, talk to yourself (I do). I know, it sounds crazy, but knowing how to speak in Hebrew and ACTUALLY speaking it is a lot different than you may realize. It helps to have conversations with yourself. I mean, I talk to myself all the time in English, so it shouldn’t be as weird if I talked in Hebrew, right? You can also record yourself speaking. This has helped me realize how I really sound and it helps me improve my pronunciation. Think in the Hebrew language. What does that even mean??? It mean when you have a thought, try and compose it in Hebrew. This is a more advanced way of learning, as it can be very challenging. When I started doing this, I found myself REALLY feeling like I was immersing myself. It’s almost as good as having an actual conversation in Hebrew! I know, I know, this sounds a bit weird. But, remember, our language isn’t only what we speak and read but also what we THINK. Maybe you just woke up and think, “Oh boy, I need some coffee.” Great, you just had a thought. Now, try thinking that same thought but in Hebrew this time. Weird, right? Don’t worry, you’ll get used to it and soon will get your Hebrew mixed up with your other language. I do this a lot. It’s okay, that means it’s working. Watch movies and videos in Hebrew (with English subtitles). Not everyone wants to “study” all the time. So, why not change your shows, movies, football games, YouTube videos all to the Hebrew language? Than add subtitles in your native language. This way, you are still learning while you relax and enjoy some entertainment. Copy the language. This is one of my favorites ways to learn! Copy the Scriptures or phrases/words over and over. When I learn a new word, I will often try and write sentences using that word. But, my favorite thing to copy is my Hebrew Bible. I absolutely love copying and studying each word and verse in the Hebrew Scriptures. Change your phone/devices language. My phone language is in Hebrew, “You’re crazy, Lydia.” Okay, so maybe I am. But, I have learned much more in doing this. I always keep a translator on my phone because I never know when a word I don’t know may pop up on my screen! Hey, you can even go all out and change the language on ALL your devices! Computers, Tv etc. I have changed my laptop so I can enjoy reading different things online in Hebrew. If this is something you’d like to try, just be sure to keep a translator handy in case you need it. This is really nice when you want to quickly learn to read in Hebrew. Use apps on your phone. There are many apps on your phone that you can use. I like using: Quizlet, Memrise, Duolingo, Pimsleur, Drops, Parallel Plus and Hello talk. They each teach and help you learn the language using different methods. There are more apps but these are my favorites. I also use social media. I follow people who speak Hebrew and than have the ability to hear them speak it and read their posts in Hebrew. Label everything. Use post-its, sticky labels, paper and tape, whatever you have. Work at a desk? Label your book, desk, laptop, paper, coffee cup etc. Do you run around with your kids in your home all day? Label the kitchen table, window, couch, toilet, anything! Label objects in your home, car, any space that you live. This helps you learn every day objects and it is a lot of fun. Seeing the objects and the word on it really benefits visual learners like me. I hope you’ve enjoyed reading about different ways I’ve immersed myself in Hebrew. May I hear your thoughts? Were these helpful and useful to you? I’d love to hear from you! What is your favorite Hebrew phrase book? This one is really helpful because it has useful information about words and sayings that the other phrase books don’t have.